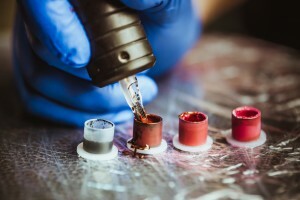 INK BLOCK designed for tattooists to eliminate wet waste is a low cost solidifying and denaturing agent that�s safe and easy to use and fully compliant. The primary purpose of INK BLOCK is to avoid wet waste escaping from clinical sacks. Rendering liquids safe to dispose of in Ormskirk - Lancashire makes sense, avoiding liquid waste escaping from clinical sacks makes them safer to handle, collect, transport and incinerate/landfill. INK BLOCK contains a chemical addition, its prime use is as a human aversive the chemical additions we have added to INK BLOCK have an overwhelming bitter taste and is ideal for helping prevent accidental ingestion. It is an odourless addition; however, the foulness of its taste and the fact that it is neither toxic nor carcinogenic makes it an ideal additive to prevent people/animals from ingesting liquids or solids by accident. We comply fully with all HSE regulations and within the guidance set down in the Tattooing and Body Piercing Toolkit. For larger sizes please give us a call and we will be pleased to assist. Get a Clinical quote today in Ormskirk - Lancashire or call us to discuss further, if you are unsure about the type of container you should be using or you have a mixed waste stream call us, we are on hand to provide advice and support. Trust Principal Hygiene for Ink Block in Ormskirk and surrounding areas.